It’s that time of year again where children are on break, relatives are coming to visit and it seams like no matter what you do there is never enough time to get everything done. Well that is why we have created this simple, easy to make and easy to share recipe for the holidays. 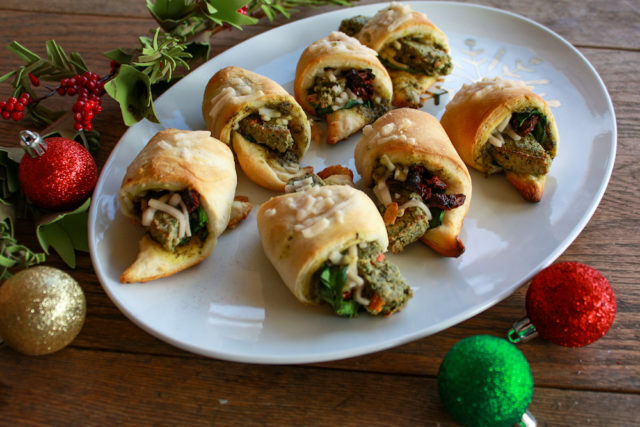 Made with organic ready-to-bake crescent rolls, Sunshine Burger Garden Herb patties and a delicious stuffing of pesto, vegan mozzarella and sundried tomatoes, this recipe will be sure to impress your guests and save you time. This recipe can be premade and stored in the refrigerator prior to cooking. Recipe and photography by Alexandra Gardner, Elovation Design. Start by pre-heating over to 375° and lightly oil a baking sheet. If you are using non-stick cookware this step is not necessary. Take two Garden Herb patties and cut each into 4 pieces long ways so that they make 4 strips or 8 total. 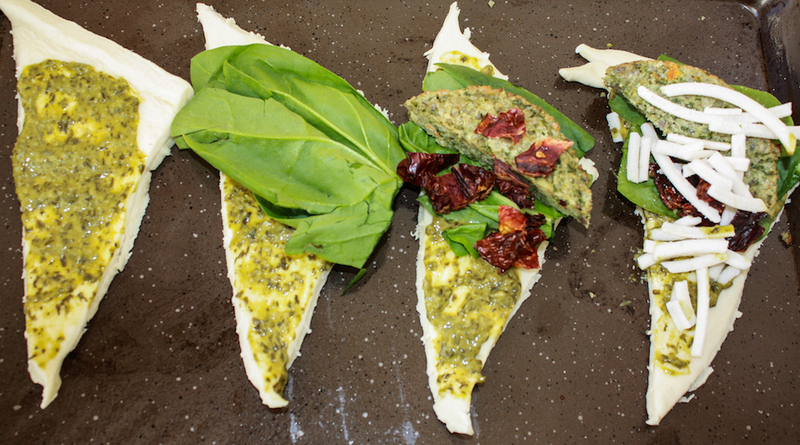 Per each crescent roll spread a thick layer of pesto, then stack a couple of pieces of spinach, then Garden Herb strip, sundried tomato and finally a little bit of vegan mozzarella. Roll the crescent roll dough from thick end to skinny and sprinkle a small amount of vegan mozzarella on top. Bake in oven for 12 – 14 minutes or until golden brown.